I set up my art directories and I wanted to double check on a couple of things. This is how it is set up. Question 1: Is the structure correct? This is all on one computer and one drive. You can ignore those buttons if you've used the setup to install your pipeline, you should be good to go. You can actually put your art pipeline anywhere you like. The key thing is to make sure that your root directory for your HeroEngine art assets are under a directory named HE (in caps). Then everything that Krun showed in his image inside the HE directory. 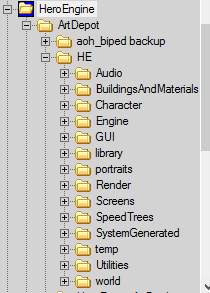 Key thing to make sure is that all of your art assets, including textures are in the same matching directories as you make and export them, this includes textures. They must match the same pathing as you make your assets as they do in the engine. I hope the added explanation can help. Please feel free to ask any questions. We are here to help! Well my download does not look like it made all the folders you two show. I used the installer but because of how this Dell computer is set up main drive is not C and there is no way to set the path with the installer. So I let it install then copy pasted but that is all there was in it. The art pipeline install is a general install. However, you can manually create your own anywhere you like for your Hero HE directory structure. The RepoBrowser is basically an FTP programme that connects directly to your world. So if you want to keep the one you have installed (your HE directory) you can, or you can create one anywhere else you prefer. From there you can either create your directories inside for your art, and then drag and drop to the server. I know this may seem vague, it is late for me, but I am hoping that it can help you. I will be around tomorrow and if no one else can help or you still need help let me know. I understand my art has to be in that directory and the Repository is like an FTP program so as long as its pointing to the right file on my drive it should be good. Correct? Maya paths are correct set to the above drive path shown in the pictures and my shelf in Maya is up. You can address this tomorrow it's late here too. Thank you I think we are just having some communication troubles. If I add a folder to my local drive I also have to make sure the same folder is added to the Repository for the server correct? Here is how the files look when I start the Repository is this correct? I do not have all the folders listed on the server on my local drive. If need be I can screenshare on Skype or use teamviewer to make sure this is correct.